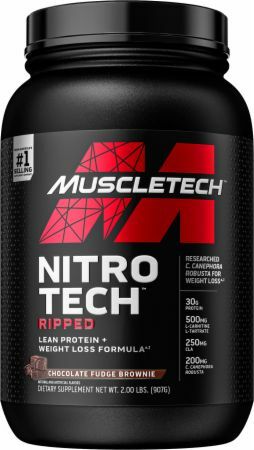 MuscleTech Performance Series NITRO-TECH Ripped at Bodybuilding.com - Best Prices on NITRO-TECH Ripped! 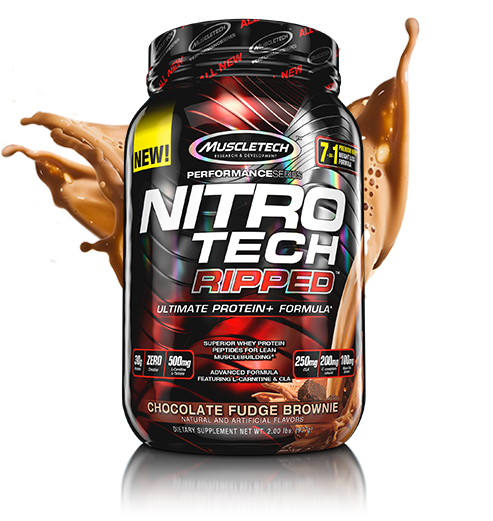 NITRO-TECH RIPPED supplies 30 full grams of the highest biological value proteins available. These are some of the cleanest sources of protein available to athletes. 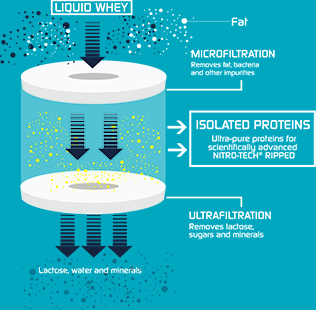 Whey peptides are powerful amino acids containing components derived from much longer whole whey protein molecules. Whey peptides can promote muscle recovery from exercise. * What’s more, whey peptides have one of the highest biological values (BV) of any protein source, a value given to protein sources to measure how well they are absorbed and used by the body. 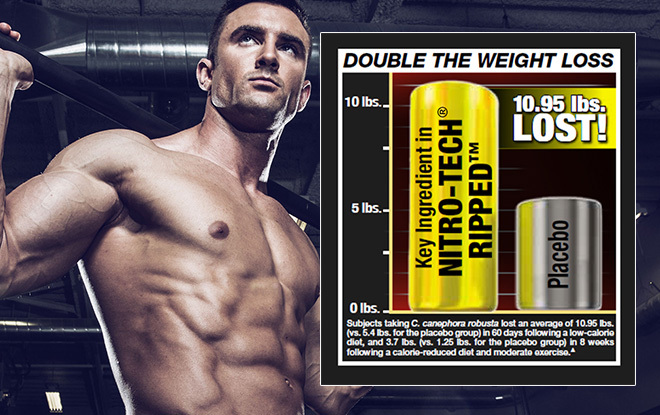 Each scoop of NITRO-TECH RIPPED contains 30g of protein, primarily from whey protein isolate and whey peptides. 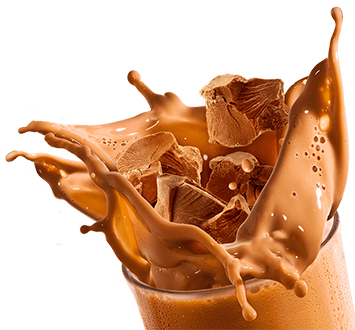 Take a look at other protein powders, and you might be shocked by what you find! Some of these proteins are loaded with unnecessary fat, while others have over 10g of carbs per scoop! NITRO-TECH RIPPED features 30g of protein, including ultra-clean whey peptides (hydrolyzed whey protein) and whey protein isolate for a clean macronutrient profile. This product caused heart palpitations for me. I have been taking Nitro tech onn and off since 2008. Started with the regular nitro tech which really helped me to loose some weight and gain muscle mass. Combine with the diet and proper workout. 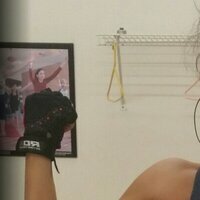 Now, recently back again to the gym and this time taking the new Ripped series. Can't tell how impress I am already. Only down side is that it comes in only 2 flavors. Please bring more flavor options for us. Thank you! I love this protein powder. When it comes to quality and taste Muscletech is spot on! Simply the best protein I have ever tried ( and I have tried many) Great variety of flavors, mixes well, no stomach upsets and no bloating. I highly recommend it! Taste is good, I have had a tad better vanilla but it's good. Mixing with anything is great. I'd say a little bit high in calories for amount of protein you get. 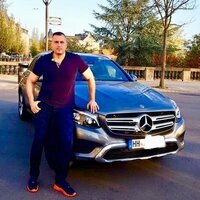 Overall it's a nice product. Directions For NITRO-TECH Ripped: Mix 1 serving (1 rounded scoop) with 8 oz. of cold water or milk twice daily. Consume 30 to 60 minutes before your 2 largest meals daily. For best results, use in conjunction with diet and exercise for 60 days. Read the entire label before use and follow the directions provided. Warnings: Not intended for use by persons under 18. Do not use if pregnant or nursing. Consult a medical doctor before starting any diet or exercise program or if you have a medical condition. KEEP OUT OF REACH OF CHILDREN.